Sometimes, it’s surprising how much a game can tell you about it’s designer. Take i9n, for example. Without any other source than the game, we can be virtually certain that it’s inventor, Dirk Strothmann, is or at least has been working in IT. How can we know that? Elementary, my dear Watson. The name itself gives him away, because i9n is an expression that IT people would come up with, meaning “an i, followed by 9 letters, followed by an n”, which can, for example, mean “information”. The next, bigger hint is that the game’s central element is a set of punch cards, a technology that few people from other professions would consider using. Of course, all this might be utterly wrong and he could be a lawyer, or a doctor, or maybe a civic engineer. That’s the risk of deducing from very little given data, it might be wrong. When playing i9n, you don’t generally have to worry about having too little information, the game always gives you just enough, and not one bit more. Also, unlike many other deduction games, your goal is not to find out that the one-legged man is Spanish and used to be a sailor in traditional Sherlock Holmes style. Instead, you go hunting for the last producing oil well in the world – and I’m sure any commentary on current geo-politics is completely unintentional. You search for the last bubble of squished, mineralised dinosaur on a map of the world that is split into 64 areas, each with one potential oil well to drill into. 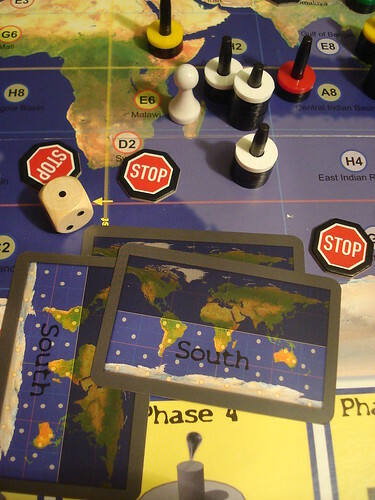 Each area is uniquely identified by six binary attributes – binary being a keyword in the game system, as some of you may have noticed already: they are either in the east or in the west, in the north or in the south, near the equator or near the pole, in the Atlantic or Pacific area, on land or in the sea and, because at this point geographical areas are pretty much exhausted, in the fog or in the sun. Choose one option for each of these distinctions, and there is exactly one area on the map that will match. Or, to keep the computer geek crowd engaged here: your goal is to identify a six digit binary string. The game comes with 6 sets of two punch cards, each giving one attribute from the list above. To start, you select one card from each set at random. The distribution of holes in the cards has nothing to do with the distribution of drill sites on the map, so you cannot get an accidental glimpse at a card with all the wholes in the upper half and know that it must be the north card, for example. Each player may now secretly check two of the punch cards, providing some information to start with to everyone. Then, the first card is inserted into the processor. While “the processor” may sound like a complicated piece of equipment, what it really is is an area in the game box that fits the punch cards exactly and keeps them properly aligned, plus an additional card with all the holes punched to hide the real cards from view. Buy stock: there is three stock cards (which might be more aptly called “drilling concessions”) available for every attribute a drill site can have, and their price is determined by how many are left. When all three cards are available, you buy the card for one point of your die, after one is gone the next costs two points and the final one is worth three. 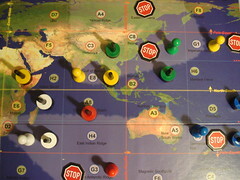 Drill: attempt to drill at the position of one of your meeple. To drill, you use one of your stock cards that matches the site. All drill sites are labelled with letters A to H and numbers 1 to 8. You insert the drilling stick into the processor at that coordinates, and if it goes all the way through, you found oil. You may mark one of the drilling derricks with your colour and place it on the map. The card you used to drill is removed from the game. If, on the other hand, the drill stick does not go through the processor, you put a STOP marker on the map and return the concession to the supply. One neat idea to reduce the influence of the die on the game is that you can sell the stock cards back to the supply, for the current price. That way, you can invest some points in non-critical situations and use them later in the game when you really need to do things, but rolled a one. i9n plays in phases, each phase ending when all the derricks for that phase are on the map. 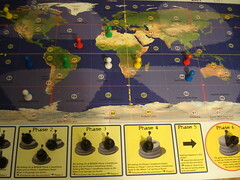 In phase one, there is 4 derricks available, and each successful drill is worth one victory point, marked by one black ring on the derrick below your colour marker. Phase 2 has three derricks worth 2 points each, and so on. After each of the first three phases, one additional punch card is inserted into the processor, reducing the number of active oil wells by half each time. During the first four phases, there are two restrictions on where you can drill: you can not drill again on the same square that had a successful drill in this phase or the previous one (you can presumably drill again at a failed drill site from this round, but why you would want to is beyond me) and you can not drill in an area directly adjacent to a successful drill from this phase. It bears keeping in mind that the east and west edge of the map are connected, so the “no drilling in adjacent areas” rule applies across the edge as well. 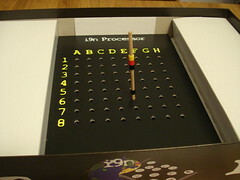 These restrictions to where you are allowed to drill may seem arbitrary, but they turn out to be rather important for the game: if you ignore these rules, your drilling does not generate enough new information to be certain which punch card was inserted for this phase, so you can only guess what to do on the next. Once phase four is over, the showdown starts. The two last punch cards are inserted at once and the hunt for the one remaining active oil well, worth 6 points, begins. If you paid attention so far, there is only four possible spots now, and everywhere is open for drilling. Picking the right one now is mostly a matter of luck, either by picking the right one blindly, or by being lucky enough to have the two punch cards that you saw at the start go into the processor last. In that case, you now know exactly where to drill. Once the black gold is flowing, all players count their points. On top of the oil derricks, every stock card you still own that could have drilled the final well is worth one point. i9n does two things to the genre of deduction games. First, it comes up with an innovative mechanism to evolve the available information over the course of the game. Adding punch cards to the processor is an easy way to add information without any of the players knowing what that information will be. And while the concept of punch cards may sound scary to the less technology-affine among us (how are you guys reading this, anyway?) in practice the only knowledge about punch cards that you need is that a wooden stick can only pass through it where there is a hole. Also, the processor part of the box is a good fit for the punch cards, so you do not have to worry about the cards not being aligned properly. I’m not entirely sure how well that part of the box inlay will age. It does remind me of some paper inlays from older games that lost their shape after a few years, but that’s a detail I’m not going to worry about now. All the materials are fully bilingual by the way, so even if the box has scary German text on it, all non-German-speakers can just unpack and get stared. Second, i9n adds a layer of strategy to the “pure” deduction. Of course, figuring out where the last oil is going to come from is the main objective of the game, and keeping the others in the dark about what you know is as important as ever in this genre, but: the last well is not valuable enough to win the game on it’s own. You will want successful drills in the other phases, and if you did good there, you may win even without getting the big one. Managing your stock cards is a key strategy here. You should always make use of the option to buy cards when you have points left on your dice and are not sure what to do with them. Using those cards later to perform additional actions – maybe even more than you paid originally – can turn the game in your favour, and having three “correct” cards at the end can make enough difference to win. However, there is one thing to consider before you go out and by your copy: i9n is not free of luck. The luck of the dice can be managed by buying and using concession cards, but if you consistently roll ones, you will be at a disadvantage. (As an aside here, we discovered yesterday that other players rolling the die consistently scored higher when rolling closer to yours truly – I’ll have to keep an eye on that and maybe leave the table when it’s not my turn). Also, having the two punch cards you saw going into the processor last gives you an edge over someone whose cards are inserted early in the game. Personally, I am not bothered by either of these things, their influence on the game is not so big. But I know there is purists out there that want their deduction games to be strictly skill-based, so I felt I should give a little heads-up. Strothmann Spiele is already hinting at more games to come based on a similar punch card system on their website, and I’m looking forward to see what other games they can build around it and if they’ll be as much fun as i9n is. I want to say thank you to what I can only presume – or maybe deduce – to be family Strothmann once again for the introduction to i9n at Essen, we had a lot of fun learning the game from you, and it was great to see you guys with so much enthusiasm for gaming and quite obviously having fun, as well. Strothmann Spiele came up with an alternative to rolling the dice, for those of you with chronic bad luck. See the update here.